What on Earth....? Just what are we seeing here? I think looking at this, one might be inclined to agree with the coineys that some museums really have no idea about handling ancient coins. And this is the British Museum? Shocking. Let us talk about alloy recrystallisation and grain boundary corrosion. And how do they get the coins off the backing board they've nailed it to? A little hacksaw? Send them back to Sicily if you are going to treat other people's cultural property like that. For goodness' sake! I suspect you're just having a tongue-in-cheek dig at the BM. I imagine you're guessing as well as I am that the "backing board" will be inclined for display and that the "nails" are merely holding-pins (with inert coating) on which the bottom edge of the coins will rest to prevent them sliding down. It does look alarming at first glance though! No I am not. I realise the panel pins we see in the foreground are being used to mount the coins. If you look, there is a coin under the hammer. This person is hammering a panel pin into a backing board with the coin in position. That is what I am referring to. One slip of the hammer and that coin is going to be damaged. Also the other coins are laid out, apparently loose on the backing board while the hammering is going on. Nobody should be coming anywhere near these coins with a hammer. 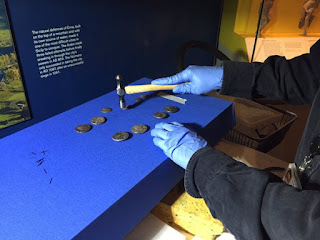 If it is to be inclined with the coins resting on (say) two panel pins supporting the lower edge, then that can all be prepared without the coins being there by marking where they will be. In any case, there is no reason, surely, why a softer board cannot be used for backing and longer pins gently pushed in by hand to avoid the use of hammering. "If you look, there is a coin under the hammer. This person is hammering a panel pin into a backing board with the coin in position." Ah, I viewed on a small screen and didn't see that. Even if only quickly posed for the camera, that is indeed a very disconcerting thing to do and I would not have thought that even leaving coins loose while hammering nearby is best practice.